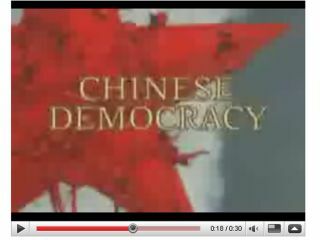 With just one day to go in the presidential race, a Guns N' Roses Chinese Democracy TV commercial has aired that is overtly political in nature. The Guns N' Roses ad, which ran over the weekend on Saturday Night Live (which just so happened to feature a guest appearance from Republican presidential hopeful John McCain), is also set to run tonight (3 November) during Monday Night Football on ESPN in the US. After the above message, the commercial runs through a rapid-fire succession of words such as "black" and "white," "man" and "woman," "Democrat" and "Republican." Subtle it isn't. But when you've spent 14 years and $30 million making an album, nuance isn't a luxury you can afford. Click here to see the TV commercial in its entirety.